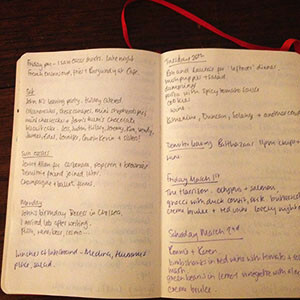 Every new year, I look back over my dinner party diary and work the stats. 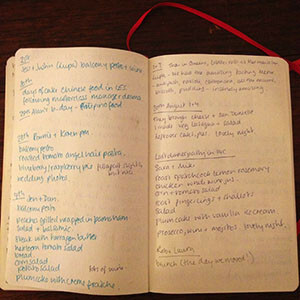 The dinner party diary is a record of all the dinners I’ve cooked, all the dinners I’ve been to, and anything notable about what I’m generally cooking or eating. I keep track of what I fed to whom, so I don’t give people the same dinner twice. I track allergies, preferences, tweaks I should make to the recipe next time I cook, successes, disasters, sometimes who said what. I’ve kept a record ever since I left cooking school when I was 19. Yes I am aware this could be construed as being a touch obsessive. Anyway, highlights from 34 dinner parties. Most cooked hot weather dinners – linguini with fresh tomato sauce. Steak with tarragon butter, roasted sweetcorn salad, and lemon fingerling potatoes. Pesto with balcony basil on bruschetta. Plum cake. Pavlova. Most cooked cold weather dinners – pork ragu. Hands down winner. Sometimes with papadelle, sometimes orichetti, sometimes polenta, sometimes celeriac puree. Rosemary lemon garlic roast chicken. Carbonara. Salad with raw fennel, goats cheese, lemon and toasted pistachios. Best cocktails – gin and tonics, with cucumber, lime and mint muddled into the gin, shaken with ice and topped up with tonic. Steaming Bishops. Pitchers of Sea Breezes. Looking forward to another year of good food, good company and good friends, and wishing you a very happy 2014. This entry was posted in Uncategorized and tagged best cocktails, dinner party, easy, most cooked, round up, stats. Bookmark the permalink.